Known in Germany as Einkorn, and in Italy as Farro Piccolo, Einka comes from Bluebird Grain Farms in Winthrop Washington. I had tried a bit of einkorn grown by Lentz Spelt Farms, available in Seattle at Big John’s PFI, but the price tag of $6.75/lb kept my quantity low. It was enough, however, to see, feel, use, and taste the difference. After receiving my order from Bluebird less than 24 hours ago, I have been on a bit of an einka bender: pasta, chocolate chip cookies, and now waffles. If you are unable to consume all the waffles in a batch, let them cool on racks, wrap in parchment, and place in a freezer bag. They thaw and re-crisp under an oven broiler. Adding a scrambled egg and some fresh fruit, gives Junior a break from our usual breakfast routines. 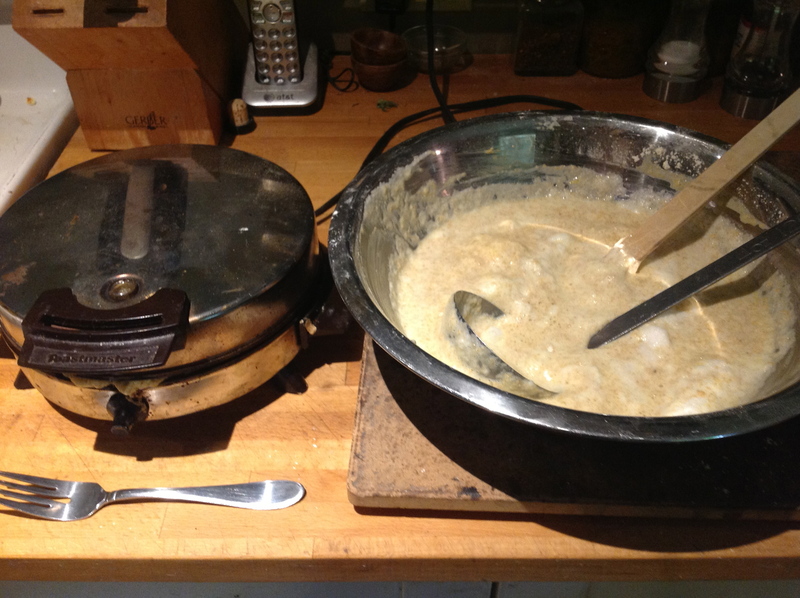 Oh, and just so you know, waffles do NOT need any added sugar in the batter. 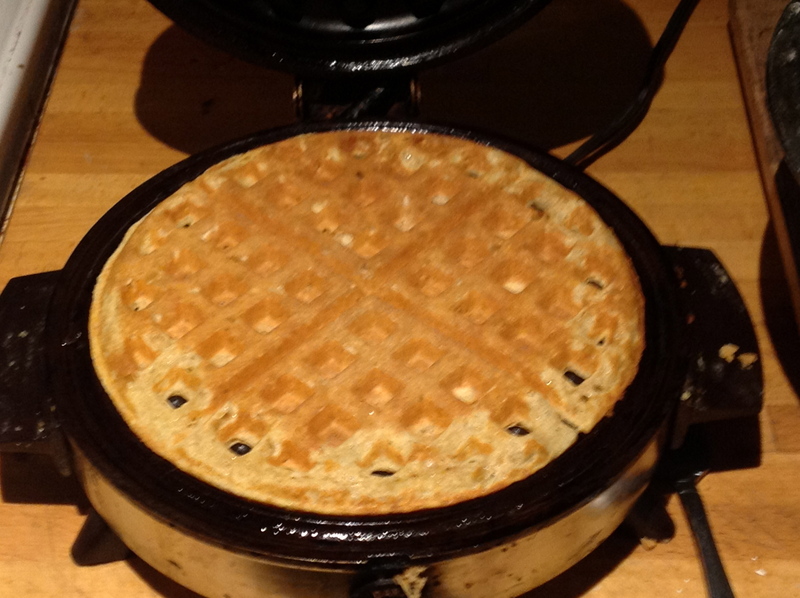 Enjoy the baked waffles with Grade B Maple Syrup! 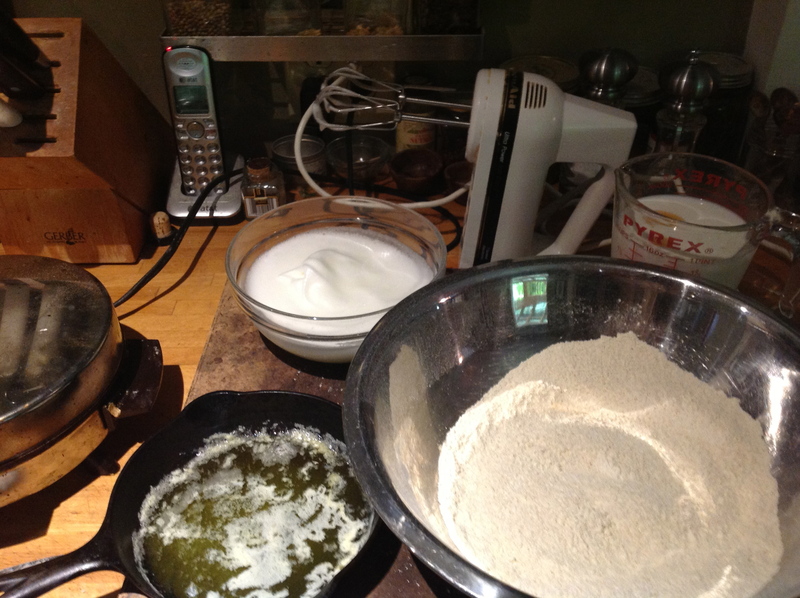 In a mixing bowl, whisk together the flour, baking powder, and salt. In another bowl, combine the egg yolks and milk. Whisk together while adding the melted butter in a steady stream. Whisking will keep the eggs from scrambling if the butter is too warm. In a small bowl, beat the egg whites until peaks form. Don’t overbeat as the whites will become dry and difficult to incorporate. Add the milk mixture to the flour, mixing until just moistened, but leaving some lumps. Gently fold in the egg whites. This is wonderful! Thanks so much for posting information about einka flour! Oh-it’s all my pleasure! Thanks for reading!